On Sale £37 - all incl (No hidden extras). The original Clean 'n' Clear is unnecessarily expensive even for the usually overpriced fridge filter market. We have developed this budget alternative at a more reasonable price. 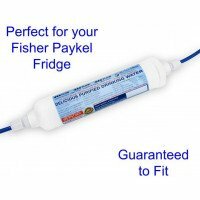 It's been supplied to hundreds of happy customers so you can rest assured that it doeas a perfectly good job filtering your fridge water. Easy design for easy replacement. 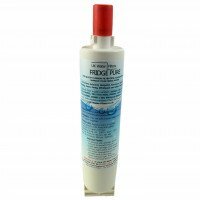 This replacement fridge water filter contains a high quality compressed carbon block with tremendous capacity to remove impurities from your drinking water. This is a brand new, unopened, original filter direct from the factory. Your filter comes in the original packaging. This fridge water filter has a life of up to 6 months, or when the change filter light comes on. Please note the red light is based on time only. It is not any type of water quality sensor. Change it before 6 months if the water pressure noticeably decreases. 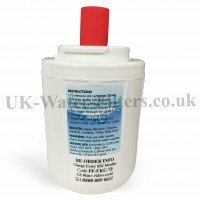 Replace the filter sooner than 6 months if you notice any change in taste and odour in the water - eg chlorine. The filter must be changed every 6 months regardless of amount of water consumed - or if the fridge has been unused for more than two weeks. This is because bacteria can grow inside the filter. So once "wet" it needs to be changed after 6 months. We will send you a free reminder to change. Like all fridge filters it should not be used with water that is of unknown quality - ie non mains water supplies or - without adequate disinfection before and or after the filter. drinking cool filtered water straight from the fridge is a revelation. It beats any bottled water I have ever bought. Well worth the money (much cheaper than buying direct from the 'fridge manufacturer). I would recommend this to anyone. I have now used this product twice and each time it arrived promptly and was very quick to install (it helps that I have located the filter under the sink allowing easy access). 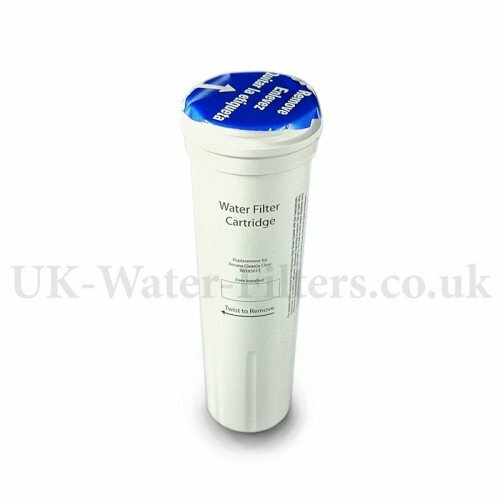 Whilst it is about £10 cheaper than buying it from the 'fridge manufacturer, I still find it it a lot of money to spend each year on filters. Having said that, it is a lot cheaper than spending money on bottled water. All I have to do now is convince my wife and children that filtered water is as good as the bottled water they buy. Unfortunately, they are still buying the stuff because it is handy to carry around! all very easy and when there was a small issue with delay, they were very helpful and understanding. I would recommend them and will use them again.